ZO Oclipse Sunscreen + Primer SPF 30. All products contain high-quality ingredients, such as antioxidants and plant extracts. With repeated use, skin is left feeling rejuvenated and stronger. What is ZO Phase 2, Anti-Aging Program formulated to do? Unfortunately, skin can deteriorate thanks to internal aging and external damages. These factors cause the skin to lose its vigor and elasticity. Already weakened skin is further damaged by external aging factors, including uncontrolled sun exposure, pollution, smoking, and an unhealthy diet. As a result of these factors, aging signs, such as wrinkles and hyperpigmentation, become more pronounced over the years. ZO Phase 2, Anti-Aging Program is created to repair any damaged cells. Not only that, the kit encourages new cell proliferation to help strengthen the skin. Future dermal damages are also halted before it occurs, so as to preserve the appearance of improved skin. 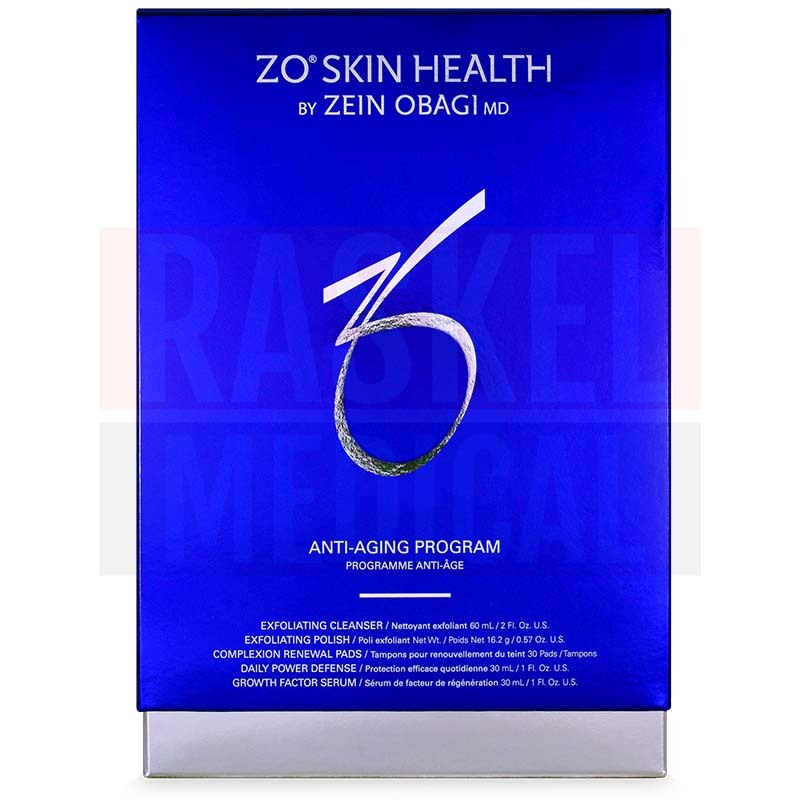 ZO Phase 2, Anti-Aging Program is manufactured by Zo Skin Health Incorporation. The products are formulated by Dr. Zein Obagi, a highly praised skin expert. This skincare range is made in Europe. One of the major side effects of this skincare collection is increased sensitivity to the sun. This is because some of the products contain cell renewal agents, like retinol, that stimulate the production of newly-synthesized cells, which are quite delicate and sensitive to sun exposure. Besides that, some patients who are sensitive to any of the ingredients may develop skin irritations and rashes. Because of this, patients should read and understand the product information manual to help prevent any untoward effects. Patients should also follow sun protection methods, such as applying sunscreen, avoiding extended sun exposure, and wearing protective clothing, to better protect their skin health. This skincare kit is designed for skin that is already exhibiting early signs of aging, like fine lines. In fact, patients between the ages of 26 to 44 whose skin has been aged by environmental damages and normal, biological aging may respond well to this anti-aging program. What are the differences between the products? The products in this kit are designed for different skincare steps, such as cleansing, exfoliating, and moisturizing. They are designed to work together and complement each other’s skincare actions. ZO Offects Exfoliating Cleanser: Patients should use this dual-action exfoliating wash twice daily. Apply the required amount on the dampened face and neck. Massage gently and wash with plenty of water. ZO Offects Exfoliating Polish: Patients should use this physical exfoliator at least twice weekly. Apply a small amount on the dampened face and neck. Massage gently and add some water if the face is too dry. Rinse with lots of water. ZO Offects TE-Pads Acne Pore Treatment: Patients should use this solution twice daily, or as tolerated. Using the soaked pad, wipe the cleansed face and neck while avoiding sensitive eye contours. Leave the solution on to dry. ZO Ossential Daily Power Defense: Patients should use this skin restoring lotion every morning. Apply and gently massage 2 to 3 pumps of lotion on the cleansed face and neck. Follow this up with the use of sunscreen. ZO Ossential Growth Factor Serum Plus: Patients should use this lightweight gel half an hour before bedtime every night. Apply 1 to 2 pumps of gel on the cleansed face and neck. ZO Oclipse Sunscreen + Primer SPF 30: Patients should use this multifunctional sunscreen 15 minutes before sun exposure on a daily basis. Apply 2 to 3 pumps of sunscreen on the cleansed face and neck. This 6-step skincare kit is designed to repair, renew, and protect the skin. Potent ingredients, including Ultrasomes, Roxisomes, and Matrixyl 3000 (Palmitoyl Oligopeptide and Palmitoyl Tetrapeptide-7), repair damaged cells effectively from the DNA level itself. Besides that, components like glycolic acid and ultra-fine magnesium crystals remove any old cells to make way for new ones. Healthy cells are synthesized at a quicker rate due to combined action of proliferative agents, including retinol and ZPRO, the latter of which is a patented peptide-antioxidant complex containing hydrolyzed sericin and Buddleja davidii Extract. Once the skin is repaired and renewed, protective ingredients, such as ceramide 6 and vitamins A, C, and E, scavenge toxins and deliver intense hydration. With repeated use, the skin is left feeling rejuvenated and stronger. The products are supplied in their corresponding packaging. Patients will receive an accompanying product information manual in the product packaging. With consistent usage, dead cells are removed, and healthy new cells are produced for a younger complexion. The duration of effect and time taken for these improvements to occur vary on an individual basis. Most of the products contain potent ingredients, such as plant extracts, peptides, antioxidants, and vitamins. Hence, this skincare kit must be stored in a room with a controlled temperature away from harsh sunlight and children. Given that ZO Phase 2, Anti-Aging Program is not itself a skincare agent but rather a number of different types of such agents, there is no singular shelf life. Instead, the shelf life varies on a product-by-product basis, so keep this in mind.